In my recent Sephora order, I recieved some foil pouch samples. 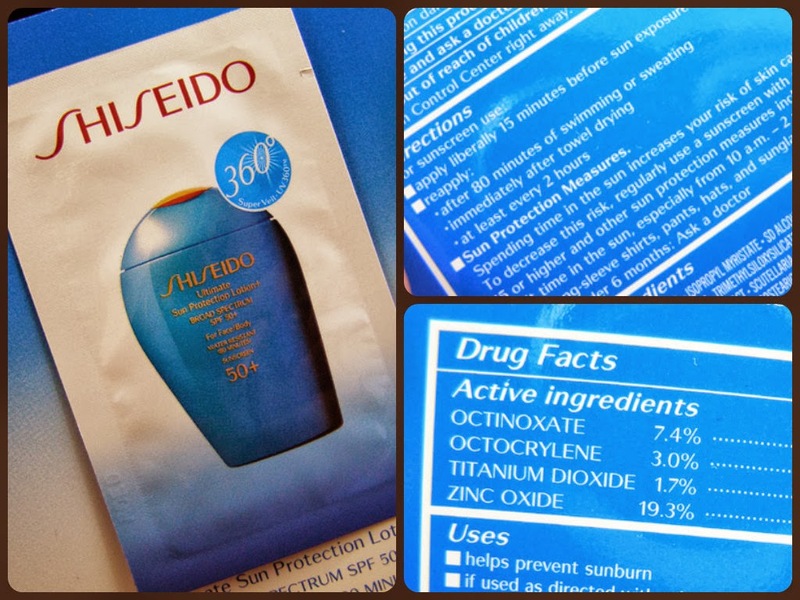 One of the samples I was most interested in was Shiseido Ultimate Sun Protection + Broad Spectrum SPF 50 for face and body. It has pretty good reviews on Sephora, and not-terrible ones on Makeup Alley. 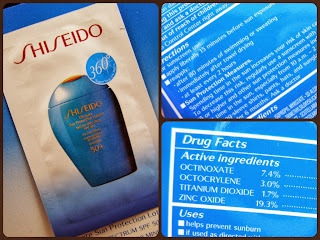 I decided to give it a test drive, as I have been on the search for a good face sunscreen for quite a while. This stuff is very scented. If you are sensitive to stuff like that, you might want to avoid this. I generally hate scented face products, but I actually don't mind this. It has a nice floral-citrus-perfumey scent. Very feminine, to be sure. It either fades away after about ten minutes, or I have ceased to notice it. Either way, it's gone fairly fast. This stuff spreads. When I (carefully, I swear) tore open the pouch, it spurted out and made a bit of a mess. It is more liquid than cream. Which, I suppose, is a good thing as it means that it will spread over your face a lot easier. I didn't need a whole lot to cover my face and neck, which is good. I hate the goopy feeling of most sunscreens. It does have a more matte feel to it on my skin than my usual sunscreen, which is nice. 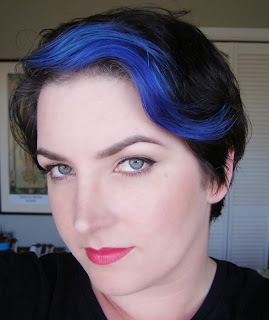 My skin is dry/combo, so it's hard to find products that play nicely. After an hour, it is exactly the same shine-wise as it was when first applied. I think this would also be a comfortably body sunscreen. You wouldn't have that sticky sheen that a lot of sunscreens leave...I have no interest in feeling like I'm coated with sweaty caramel. It leaves a white caste. So many higher spf sunscreens leave this awful white caste on the skin. It takes a while for it to soak up, and this one is no different. Be warned, if you are darker, this is going to look a little weird. From Sephora, this stuff runs $39 for a 3.3 ounce bottle. That ends up being almost $12 per ounce. I dunno, that seems kinda high for a sunscreen. When I compare that to the Neutrogena stuff I normally use, which is $12 at Target when not on sale and around $4 per ounce...it's a bit of a shock. But it does perform much better, overall, so perhaps it is worth it? I decided to try it under my Bare Minerals foundation, since that is generally the easiest for me to control. I dunno if it was my skin's current state, or the sunscreen making for a poor base...but it wasn't awesome. I definitely had trouble around my nose with the foundation application. A liberal application of my homemade setting spray certainly helped with the cakey look. 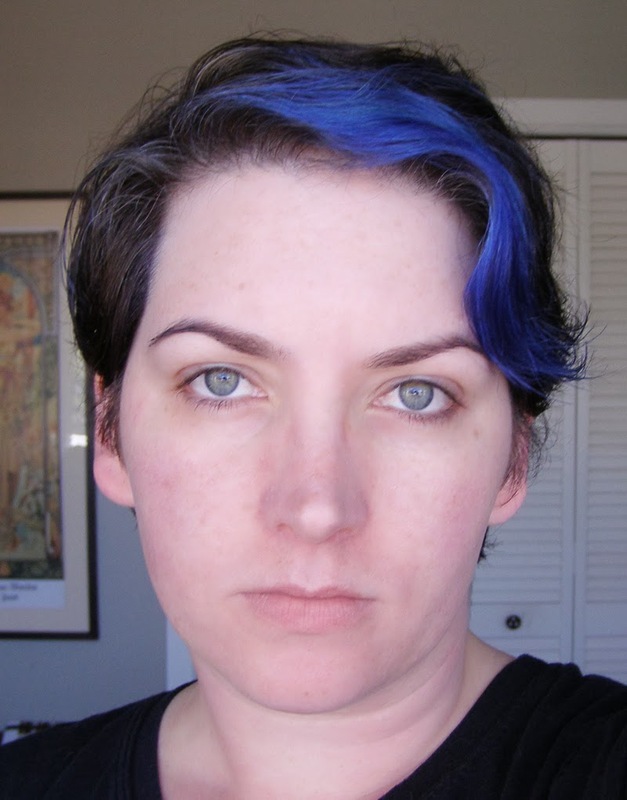 I think I need to try using a regular liquid foundation instead, before I can definitively say. My face did stay relatively matte all afternoon and evening, which was awesome. I didn't have to use blotting papers, and everything seemed to stay right where I put it all night. (confession: I accidently slept with it on...still golden in the morning) So if you have trouble with sun protection making your makeup slide and fade, this is definitely worth investigating. all done up with limited places to go. The strong smell and funny initial hue of this sunscreen are a bit off-putting. But the comfort and matte skin more than make up for it. Try it if you get a chance. There is lot of difference in both pictures. This product is really effective and also best for treating skin infections caused by sun.